Der Artikel Shawn Colvin: These Four Walls wurde in den Warenkorb gelegt. Recorded in New York and Austin, These Four Walls was produced by Colvin’s longtime collaborator, John Leventhal. Of the album’s 13 tracks, nine are co-written by Colvin and Leventhal and one, “I’m Gone,” is penned by Colvin herself. 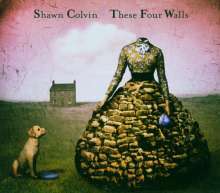 The album also includes two cover tunes, a practice for which Colvin is well known. These Four Walls features several guest artists: Grammy Award winners Patty Griffin and Marc Cohn on “Cinnamon Road,” English singer / songwriter Teddy Thompson on “Let It Slide,” and renowned pedal steel player Greg Leisz on the title track. A longtime critical favorite, Colvin became known worldwide with the success of 1996’s platinum selling A Few Small Repairs. The No. 1 radio single “Sunny Came Home” earned her a Top Ten hit and two of Grammy’s highest awards: Record of the Year and Song of the Year. Colvin won her first Grammy for her 1989 debut album, Steady On.